I am Nice, Kind, Giving, Calm, Barely ever get angry. I had been practice being good well for a long time and very positive person since I am a little girl. and i had been told myself that I will not raise my voice on my Man or who ever. I am intelligent. I don't ever say any Swear Words. I don't Smoke, don't do drug, or Drink ( I am allergic to Alcohol ) I don't go out much.. Because I consider of my time that I be on my PC to do good thing to help other and make life more beneficial... But now i am ready for dating.. I am looking a Nice, Kind man. to be with my life. I want some one to be with me. to love me for who I am and I want to give my love to him. I love the feeling of being love.. and when I am falling in Love....and it is so beautiful... and i giggles a lots when i am In Love... Its is a Wonderful Feeling of Falling In Love. and also hurt like HELL when my Heart is broken too. 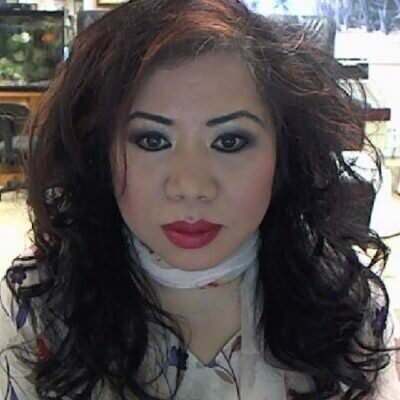 What I do for living is I do hair, nails, skin care, eyelashes extension, Make- Up artist, permanent make up, chemical peel and microderma - brasion.. beside that I self learning that I can do lots other thing like making website to help people.. i can sew most every thing except vest. embroidery.. I draw pretty descent. I also was do a lots of flowers arrangements.. some of them as big and tall as 9'.. high.. do to my last few year ago business a furniture store so I do lots of that. Now is closed.. I have a great knowledge in Buddhism. and I can speak to help people to have peace to their mind too. and most of the time people are happy when I talk to them... but important they are the one who do the action to change their live or not.. I can't change their life if they don't do nothing with it..But at least I giving them a guiding light.. and one day .. when the time is right .. they remember what i had said before and change to be a better person. Nice, attractive, kind, caring, commitment for relationship..
Dinner or Coffee in a nice cozy and quiet place so we can talk to get to know each other..